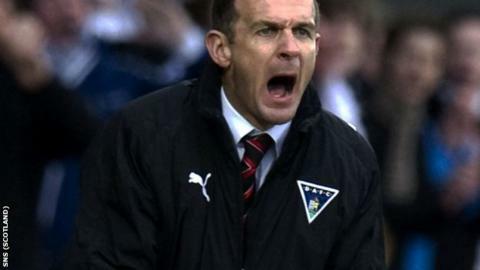 Dunfermline Athletic have sacked manager Jim McIntyre, with their chairman admitting it was a bid to save the club from relegation. McIntyre's side have not won at home this season and sit bottom of the Scottish Premier League. "It was really because of our league position and the home record," said John Yorkston. "We made the decision at a board meeting on Tuesday night. "There were 10 directors present, but we decided to reflect on our decision." With a tight budget, the 39-year-old McIntyre retained faith with most of the squad he led to the First Division title. But a recent revival by Hibernian under their new manager, Pat Fenlon, has left the former striker's side four points adrift at the foot of the table without a win in eight games and only one since November. "We felt that it was right to take action now while there was still a chance for someone to come in and freshen things up," Yorkston told his club website. "We do not have a bad squad, injuries have not helped. "We have certainly been the equal of many of our opponents this season, but we just didn't get the breaks." Dunfermline are likely to look for someone with experience, but Yorkston insisted that they did not have a successor lined up and that assistant manager Gerry McCabe would take training on Monday. "We will look at folk who might be available instantly, but contractual obligations may mean that we go for a short-term option if the long-term option is not immediately available," he said. "The short-term solution might become the long-term one and it will be up to whoever comes in to decide whether they want to retain Gerry's services." McIntyre began his playing career with Bristol City before joining Airdrieonians and was in the Kilmarnock side that lifted the Scottish Cup in 1997. Spells at Reading and Dundee United followed before he switched to East End Park in 2006. He was appointed Dunfermline's caretaker manager in December 2007 and was handed the job on a full-time basis the following month on a two-and-a-half year contract. Under his guidance, the Pars won the Division One title last season by 10 points from Fife rivals Raith Rovers. They had a promising start on their return to the top-flight before a steady decline that Yorkston said left him "personally disappointed" to part with "a lovely guy". "The board have decided that it is in the best interests of the club," he added.